Hockey is one of the most popular sports in North America and parts of Europe. The sport is simple in concept: two teams of six players (five skaters and one goaltender) have to score the most goals by shooting the puck into the opposing team’s net using hockey sticks, but if you’re looking for hockey skates, odds are you know how to play. Hockey originated from ground-based games played in the early 1800s, it was further refined into something more akin to the contemporary game during the late 19th century in Canada, more specifically, in the city of Montreal. Since then, hockey has evolved into one of the most-widely televised sports in the western world. The NHL (National Hockey League) in North American, joined with the KHL (Kontinental Hockey League) in Russia, together make up the large majority of hockey viewers in the world. Now, onto the subject at hand: hockey skates come in plenty of forms and can vary greatly in terms of characteristics depending on the position you play. Considering that the playing surface in hockey is made of ice, good skates that work well for your position are one of the most critical pieces of equipment for a hockey player, so you should know what you’re looking for and try to get the best quality skates for your money. First, it is important to understand the basic components of an ice hockey skate. The first, and largest component is the boot, which is exactly what it sounds like, it is the boot that you put your foot into so you can wear the skate. This part of a skate is usually the most personal choice as we all have different foot sizes and shapes, and the last thing you would want while playing hockey is for your skates to be uncomfortable on your feet throughout a long game. If you have never bought skates before, we would highly recommend that you try on a few models so you can get a feel for the right kind of size and type of boot that will be comfortable. The next part of the skate is the holder, which is the plastic part of the skate in which the runner (the blade of the skate) sits. There is not much to consider in terms of holders, they do not really have an effect on the skate’s playing aspects. But generally the holder should usually be as light as possible, and they are either made of lightweight plastics and composites. The final part of the skate is the runner, which is more casually referred to as the skate’s blade. This is the part of the skate which is in contact with the ice. Except for the metals and alloys used in the manufacturing of the runner, they really do not vary much between different manufacturers because the profile of your skates is a very personal choice which depends upon your intended position and play style. 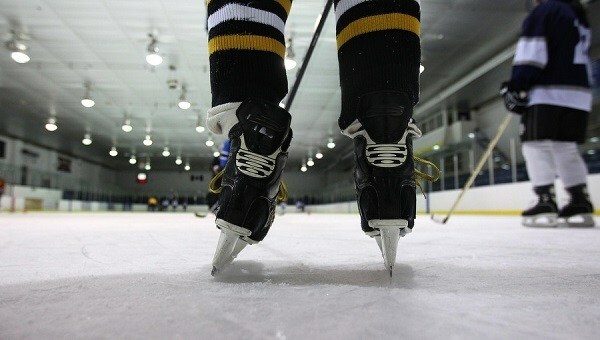 For example, a larger radius on your skates (more blade on the ice) is better for players who want to skate faster and would like a bit more stability in their skating style. On the other hand, a smaller blade radius will make your turns sharper and your skating style more maneuverable. At the end of the day, your choice of hockey skate depends more on how comfortable you are with the boot than anything else, so we would highly recommend you know your foot type and the sizes of the various parts of your feet so you can purchase skates that are ideal for you. This is especially true if you are ordering skates online: if you are a first-time buyer, you may want to try on various skates at your local sporting store before you commit to ordering a potentially uncomfortable pair of skates that you will regret. Now we can move onto reviewing individual skate models so you can find the best ice hockey skates for you. The variety of names, the array of manufacturers and manufacturer-specific terminology may seem a little overwhelming to a first time buyer, but you’ll find that skates aren’t all as complicated as they are made out to be. Starting off our list is the Bauer Senior Supreme 140 Skate. It comes with a durable Microfiber covering making it easy to use for recreational play. The covering makes it easier for skaters to use them comfortably. Thus, this is a good pair of skates for those just getting into ice hockey. For beginners, there are a few things to consider when using these pair of skates. 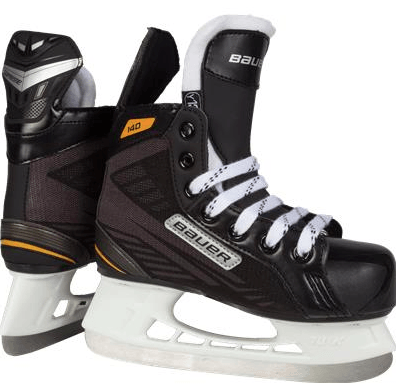 The bauer ice skates are best used for recreation due to the simplicity of the blades. These skates are optimal for someone using them about 1-2 times a week. If the skates are overused, they’ll start to lose their quality. We have noticed that the blades start off dull when you open the box. But, a pair of dull blades can spell danger when out on an ice rink. You’ll become subjected to falls and injuries if you don’t sharpen the blades. We suggest taking the skates to a local store or a rink to sharpen them before using them. Consumers across the board praise the skates because of their lightweight design. Because they are lightweight, it’s easier for the user to maneuver around the rink efficiently. Generally, these skates are ideal for beginners who want their own pair of skates. In terms of criticism, users have shared a dislike for the sizing of the skates. Their main complaint was in regards to the sizing chart. The sizing chart confused many users; making them unable to find the correct skate size. Pro tip: Make sure to order two sizes smaller than your regular size so that you can use the skates properly. Overall, this is a good pair of skates for beginners. Since they are lightweight, it’s easier for you to skate effectively. However, the skates come a few sizes larger than usual. To fix this, buy them two sizes smaller than your usual size. Mainly, these skates are good for beginners wanting to have a fun time at the rink without breaking the budget. 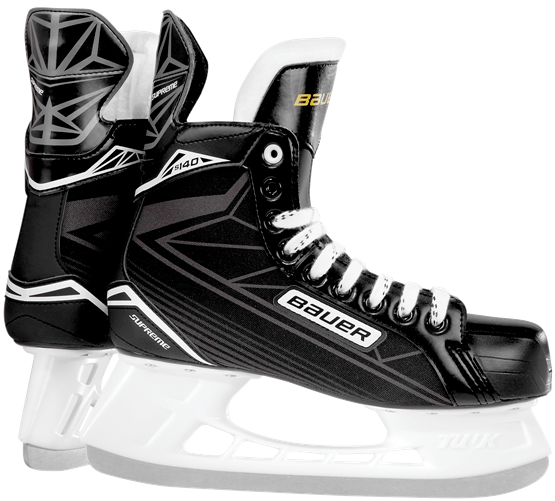 These bauer ice hockey skates are designed for younger skaters. One thing we’ve noticed about the skates are their comfort settings. For instance, the skates come with an anatomical ankle support that adds comfort while skating. This keeps your children safe when they are skating on the rink. When analyzing consumers reviews we’ve noticed a trend when it came to the skate’s durability. After the blades are sharpened, they can be used for an extended period. Because of this, we recommend these skates for children who want to skate recreationally. Another thing consumers praised across the board was the low price of the skates. 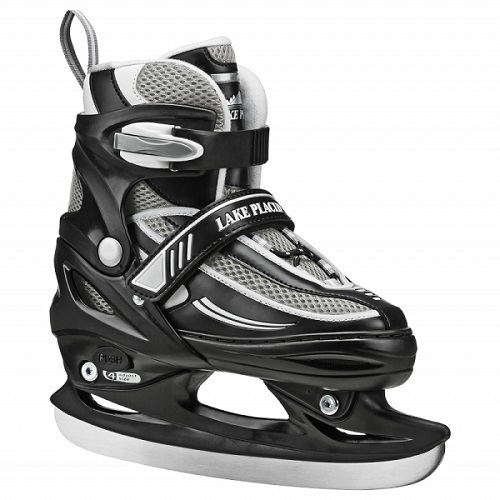 The skates cost around $70, making it a good choice for those who are on a budget. Thus, these new bauer skates are a cheap and valuable investment. But, the main issue that consumers complained about is the sizing of the skates. Bauer designs their skates different than the average size. You should buy the skates two sizes smaller than your child’s typical foot size so that he/she can wear them properly. These skates are good for children who are getting into ice hockey. When skating, the adjustable ankle support keeps the skater comfortable. Also, the skates are inexpensive making it easy to obtain. Overall, we suggest getting these skates if you want to teach your child the basics of ice skating. 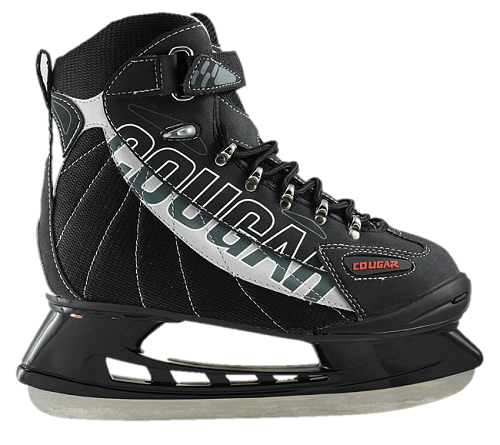 Next up on our list is American Athletic Shoe Senior Cougar Soft Boot Hockey Skates. It comes with foam padding to keep the user comfortable and improves their performance. 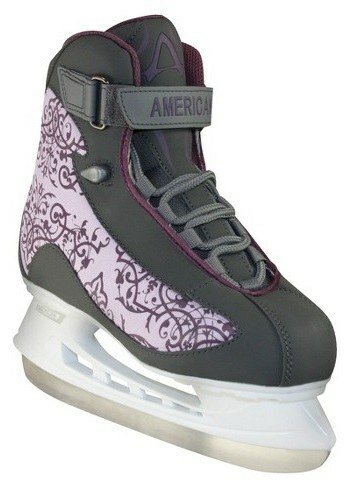 For casual skaters, this American athletic ice skate is a great choice. The skates are designed with form and functionality. For instance, it’s boot shape design means that it is easier for consumers to use comfortably. Since it is lightweight, it helps keep you agile and mobile while skating on the rink. An advantage worth mentioning is the true sizing of the shoe. Most manufacturers design their skates in a way that is confusing to the user. This leads to consumers buying a pair of skates that don't fit them properly. But, with this company, you can rest assured that the shoe size you choose will fit you perfectly. One thing consumers complained about was the quality of the Velcro strap. For instance, they noticed that it breaks after a few times of use. If this happens, we suggest contacting American Athletic to gain a refund. Even though the velcro is a weak point, it’s still a skate worth your investment. Basically, the American Athletic ice skate is a great entry level skate for ice hockey. It comes with comfortable padding to keep the user safe while skating. Additionally, the true sizing makes it easier for users to order the exact size they need. You’ll find this to be of use if you are a beginner wanting to know the mechanics of ice hockey. Up next is the American Athletic Shoe Women’s Soft Boot. It is a fashionable boot that allows the user to remain comfortable while skating. This is a great entry level skate for hockey moms and skating enthusiasts. The first thing consumers liked when using the skates was the support it provides. Female skaters noticed that the ankle support kept them skating at a relaxing and comfortable level. When skating, they noticed how the support would prevent their heels and ankles from getting injured. Thus, this a good ice hockey skate for those in need of comfort. Another advantage lies in the utility of the skates. Consumers across the board praised the skates because of their ability to be used in a variety of venues. While it can be used for recreational use, it’s also useful when practicing for competitions. Thus, this pair of skates is great for skaters wanting to improve their skill. But, we’ve noticed a pattern within the consumer’s complaints. Most consumers found issue in obtaining the right size. For this pair of skates, buy one size lower. This ensures that you’ll have a comfortable size which allows you to skate properly. We believe that the American athletic ice skate is good for women wanting to learn ice hockey. The support system allows for beginner skaters to maneuver without injuring their bodies. While the size is a common issue, ordering them a size below the advertised price can save you time and money. Last on our list is the Lake Placid Summit Boys Adjustable Ice Skate. It features a waterproof sole that keeps your feet safe and warm. If your son is a fan of ice hockey, these skates will get the job done. A feature that is praised amongst most consumer reviews is the adjustable size. Since children grow at a rapid rate, the company designed the skates to be adjusted to fit the child’s feet. This might be a good choice if you want a pair of skates to grow with your child throughout their skating experience. In addition, consumers praised the skates for their reliable support. Most ice hockey skates don’t offer a comfortable feature for children. However, these skates come with comfortable padding to keep them skating for extended periods of time. Thus, these skates keep your child skating in a safe and effective manner. However, consumers across the board complained about the size of the blades. For instance, the blades are too heavy; meaning that it could cause a problem with your child skating. To combat this issue, consider teaching your kids how to skate safely so they don’t injure themselves. Despite its flaws, this pair of ice hockey skates is a good entry level choice for children. It’s adjustable setting saves you time and money on buying extra skates for your growing child. 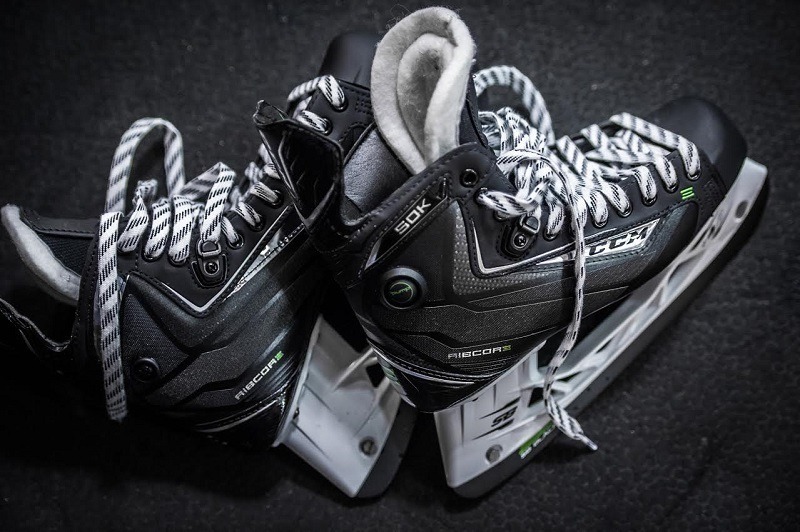 There are several things that are important to take into consideration when you are looking for a new pair of hockey skates. The last thing you would want in the middle of a hockey game is for your skates to break on you. In addition to potentially benching you for the rest of the game (if you don’t have a backup pair of skates) a broken skate can lead to some pretty serious injuries depending the severity of the break and what you are doing when the break occurs. A broken skate can lead to a few bruises, or a broken leg and everything in between, so you want to make sure that your skates are resilient and reliable. Regardless, you can have the strongest skates in the world, but in some situations, they will break. If a 70 mile-per-hour slapshot hits you right in the runner, you cannot expect your skate to withstand that kind of force without breaking. But that is all part of the game. Hockey is a high intensity sport and equipment will invariably break after a lot of use or a freak occurrence so you will never find an unbreakable skate, but you can certainly reduce the chances of your skate breaking on you while you play. The second most important aspect to consider when purchasing your skates (after build quality, of course) is how comfortable your skates are and how well they fit you. Nobody wants to play hockey in uncomfortable skates, which is why there is such a large number of aspects and foot characteristics to consider when you purchase a pair of skates. 1. The first part of the foot that must be taken into account is the instep. The instep is the tallest point of the top of your foot, it is important to see whether your instep is deeper or shallower, otherwise the vertical space for your foot inside the skate will be limited and it will be uncomfortably tight. If you have pressure on your instep it can ruin your skating ability and put undue strain on the ligaments in your foot. 2. The next part of the foot which must be measured before making your purchase is the size of your heel, which is measured in terms of width. The boot should conform snugly to your heel so it doesn’t pinch your heel, but you also should not have too much space for your foot to shift inside the boot, which can decrease the efficiency of your skating and possibly lead to injury. 3. The third thing to measure is your midfoot. The midfoot is exactly what it sounds like, it is the middle of your foot and it is usually narrower than your toe-box. Your midfoot is also measured in terms of width, and is essentially the same concept as your heel; you don’t want a fit that is too tight or too loose. A good sized midfoot area on your skate will also reduce the likelihood of injury to your foot and there is the simple matter of comfort to consider too. 4. Finally, the last part of your foot is the toe-box which is the front quarter of your foot. This is usually the widest part of your foot, so you will want a good-sized, snug-fitting toe-box. A toe-box which is too narrow will compress your toes together and increase the likelihood of a fracture or other toe-based injury. 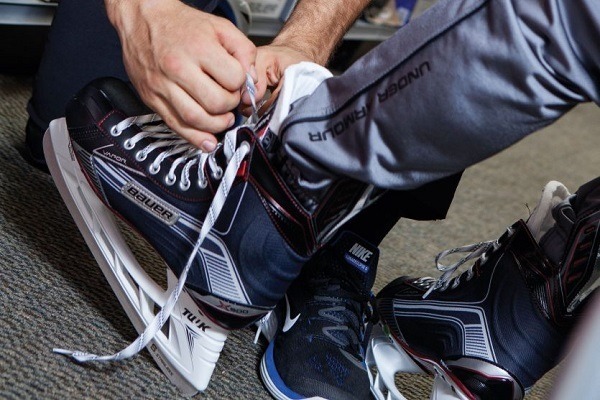 The fit of your boot is about more than just comfort; in fact, comfort is a secondary concern, because an ill-fitting boot can put you at greater risk of injury, and a foot-based injury is very bad if you play hockey. A severe one can derail your play for a long time, maybe even permanently, so you should always look out for your body first and foremost. As with all other products, an important aspect to consider before making your purchase is your budget. Dependent on how serious you are about playing hockey, you can opt for professional-level hockey skates like the ones used in leagues such as the NHL. If you simply need some skates to play with your friends on the weekends, you probably won’t need full professional level skates, and you can go with something a little more affordable. This is another aspect of the product which heavily depends on you and how much you are willing to spend, we all have differing ideas on how much a good pair of skates is worth, so we recommend you find a price zone that you are comfortable with. We believe that the Bauer Senior Supreme 140 Skate is the overall winner in terms of budget and quality. We’ve also chosen this pair of skates due to its durability, reliability, and comfort. It allows the user to skate with ankle supports which prevents injury while skating. Overall, it’s a great skate for beginners trying to learn more about ice hockey. Learning how to play ice hockey is a fun and rewarding experience. Remember, the best ice hockey skates are the ones that enhance your performance. Once you find a pair of skates that you like, you’ll see an improvement in your skills. Ultimately, these skates are the best in the market and should be considered the next time you plan on shopping for a new pair of skates.